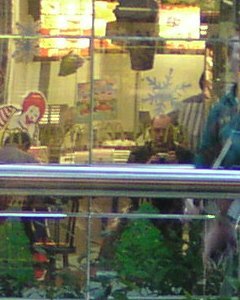 just as i was finishing my burger, i saw myself in the shopping arcade mirrors and thought it might make a nice festive photo - with christmas trees, snowflakes and a santa. however, some clown had to go and spoil it! are those elton john glasses?